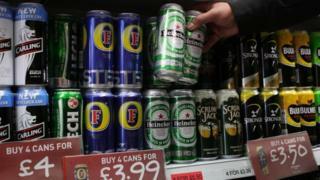 At least half of the alcohol sold in Scotland does not meet impending minimum pricing legislation, a survey suggests. More than two-thirds (69%) of the spirits currently sold fall below the 50p per unit threshold, according to analysts Nielsen. They assessed till sales data from nearly 1,200 Scottish stores. The Scottish government has said it plans to bring in minimum price legislation "as soon as possible". According to Nielsen's survey more than two-thirds of beer (67%) was priced below the minimum 50p per unit threshold, followed by 51% of cider. Blended Scotch on average would need to rise in price by 20% to meet the threshold, while vodka will have to go up by 16.3%, according to the study. By contrast, just 3.4% of wine sales made during the survey would be impacted by the new legislation. Nielsen senior client manager Marika Pratico said: "Wine is, by far, the least impacted and so has the most to gain from minimum pricing. "Overall, wine will need to raise prices by the least amount, thus, it becomes more affordable relative to other alcohol." She predicted there could be an increase in cross-border alcohol shopping among the Scottish to England and Ireland, where prices would be cheaper, "mirroring what many Britons already do with the annual Calais run". In October the Court of Session in Edinburgh ruled against a challenge led by the Scotch Whisky Association (SWA), which argued that minimum unit pricing was a breach of European Law. The SWA is considering whether to appeal the decision at the UK Supreme Court in London. MSPs passed legislation at Holyrood in 2012 to bring in minimum pricing, which would initially be set at 50p per unit.